With the increase in patient education, it’s likely that more people are wearing medical ID’s today than ever before. With all these newcomers to the medical ID world, a lot of new uses for medical ID’s are being pioneered. For instance, some parents are engraving their contact information on an id bracelet for their child to wear at school, amusement parks, and other places where they might be separated from their child. We even partner with a medical company called the Child Rescue Network which specializes in helping children and parents in these types of situations. In addition to allergies and contact information, ID bracelets (or necklaces) can also be useful for children that have special needs. An engraved ID bracelet could minimize worry while the child is away at summer camp, or it could aid medical personnel by informing them which medication(s) the child is taking if they are unable to speak for themselves in an emergency situation. Even something as simple as having the child’s name engraved on the bracelet could help reduce stress and help the child receive help quicker in an emergency situation. At StickyJ Medical ID you’ll find a fantastic selection of kids ID bracelets that are attractive and functional, plus they’re comfortable. Choose from patterns such as baseball fields, flowers, space themes including planets and stars, soccer balls, pink and purple hearts, sunshine themes and more! These bracelets are so cute that your kids will be happy to wear them and they’ll show them off to all of their friends, which is even better because it helps to spread awareness about their conditions and the other children can tell their parents about the custom ID bracelet so they can get one too. What about you? 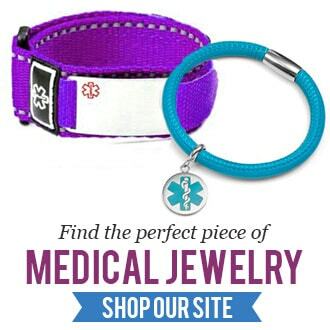 Do you have any creative ways that you use medical ID jewelry?